The dB Blocker™ Grip Intercanal is similar in design to the Classic Intercanal except instead of a wire anchor Grip has a polycarbonate tab to facilitate insertion and removal by those with larger or dirty hands. The dB Blocker™ Grip Intercanal has a Lanyard (detachable cord) can be removed from the tab where contact with machinery in motion can be a safety issue. The detachable cord increases safety and is suggested for areas where moving machinery is a concern. Particularly suited for workers in heavy soiled industries, the pull tab maximizes hygiene as the wearer does not have to touch any part of the protectors. The dB Blocker™ Grip Intercanal is a hearing protector that is actually comfortable to wear. Most hearing damage arises when an ear plug is removed for conversation and comfort. The dB Blocker™ Grip Intercanal is made to fit the individual’s ear exactly and stay in place without applying pressure to the ear so comfort is not an issue. This gives the worker a product that provides effective hearing protection and stays in the ear all day long. The dB Blocker™ Grip Intercanal also offers a helix-free design for easy insertion and removal. 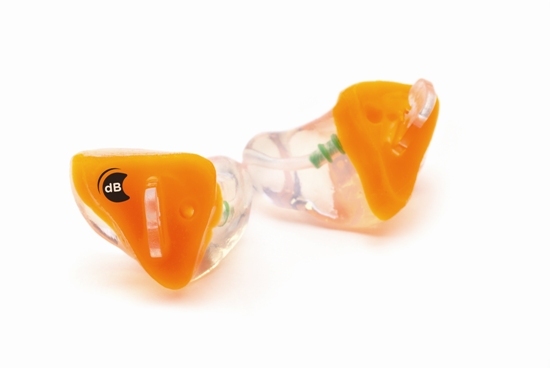 Vented dB Blocker™ Grip Intercanal hearing protectors (earplugs) contain a proprietary frequency-tuned filter that enhances interpersonal communication. In fact, people can communicate in noise better while wearing their dB Blockers™ than if they were to remove them. They can also be integrated with radio communication devices. Enhanced hearing allows the worker to communicate as well as discern warning sounds and machinery malfunctions. Vent allows ear to breathe so there is no air pressure build up. The cord attachment can match your job specifications. The helix-free design allows for easy insertion and removal.